"Styrofoam, like messes up the world." Let me start by saying, I’m not sure if Whole Foods chicken is actually humanely raised. From what I have researched, it can be pastured, at least some of the time, but I haven’t done enough digging around to figure out if I’m actually buying the best choice or if I’m being greenwashed.. But until I know better, I’m going to give it the benefit of the doubt and buy it – or at least try to. This is what happened last week. I was in Whole Foods and I saw that chicken legs were on sale for 99 cents a pound. That’s a really good price. I check the label and I see a bunch of words that make me feel reassured – vegetarian feed, roaming free – stuff like that. Like I said, I’m not sure if it’s green washing or true but I was wiling to go with it. I pick up a pack of chicken – there are two legs in the pack – which is not enough for my family, so I sort through looking for something bigger pack. Every pack only has two legs. Plus, each two-pack package is set on a Styrofoam tray. Damn, I made that myplatsiki pledge. It’s close to 7 at night and I’ve been up since 6. I’m really exhausted. I just want to buy the chicken, be done with it and go home. I put the four packs in my cart. I notice just how much plastic wrap each pack uses. I can’t do it. I put the chicken back. As I walk by the butcher counter getting ready to leave my bargain behind, I remember that when I splurge on grass fed beef the butcher wraps it in good old fashioned and environmentally friendly brown paper. “How many do you want?” he asks. The butcher is a middle-aged guy with a bit of graying at his temple. He’s solid, like a good old Midwestern corn-fed cut –with a Brooklyn accent of course. He lumbers out from behind the case filled with rows of marinating kebobs and leads me back to the pre-packaged chicken in the other case. The butcher returns to his post behind the sirloin and calls into the back. A slight, curly-haired boy comes out pushing a big cart with rows of chicken sausages in Styrofoam trays. His darkish skin pops against his pristine white butcher coat. “Whas up?” he asks me. When he says it, it sounds formal and busyness like. Ok, give me a minute. As he finishes up unloading his trays of chicken sausage I say. I think about my bags of plastic home in my kitchen waiting for a place to be recycled. I don’t think he’s right but I’m willing to allow myself this tiny glimmer of hope that I can move the trash out of my house and into somewhere that’s not the landfill. He picks up 4 packages of chicken from the display. He thinks for minute. He clearly wants to help me. I really want to be over and done with this chicken buying. “Ok,” I say hesitating. “He takes the chicken behind the meat case. I see him start to unroll a big sheet of paper. “But you’re going to make trash,” I object. I really want this to be logical and so I almost let him do it. But as he begins to unwrap the yards of plastic that hold the two chicken legs to it’s problematic Styrofoam casing,I realize how ridiculousness this solution is. He mulls over what I’ve just said. I couldn’t get the chips. And I couldn’t buy the chicken. “You want it or not?” my friend the chicken guy asks. He’s very patient with me. “Ok,” he says. I wonder if he’ll remember. Customer service to the rescue. Sort of. After I checked out I go to customer service. “They ran out?” the pierced girl asks me. “Sure,” she says, although I don’t believe her at all. What’s the moral of the story? There’s always been Styrofoam is in my chicken. 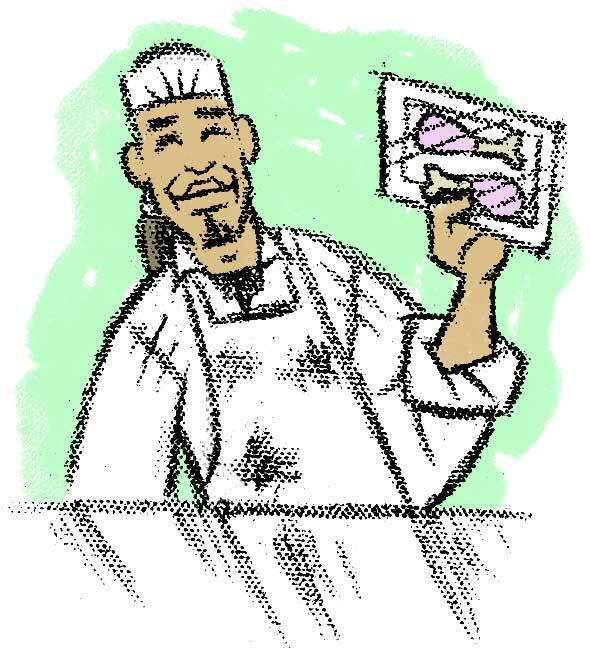 The meat expert standing behind the counter at your nearby Whole Foods Market is prepared to serve up whatever cut of meat catches your eye in the cooler or case, packaged especially for you and accompanied by cooking tips and sage advice only a real, experienced butcher can provide. So does that mean that vacuum pack is more old fashioned than Styrofoam? I really hope not. I guess it’s time to do more research into the chicken question.